Today's skittle nails showcase these beautiful Color Club neon minis I picked up from a recent trip to a beauty outlet. I have here All That Razz, a purple-tinged pink (middle finger), Youthquake, a bright coral pink (ring finger), and Warhol, a hot pink (pointer and pinky). 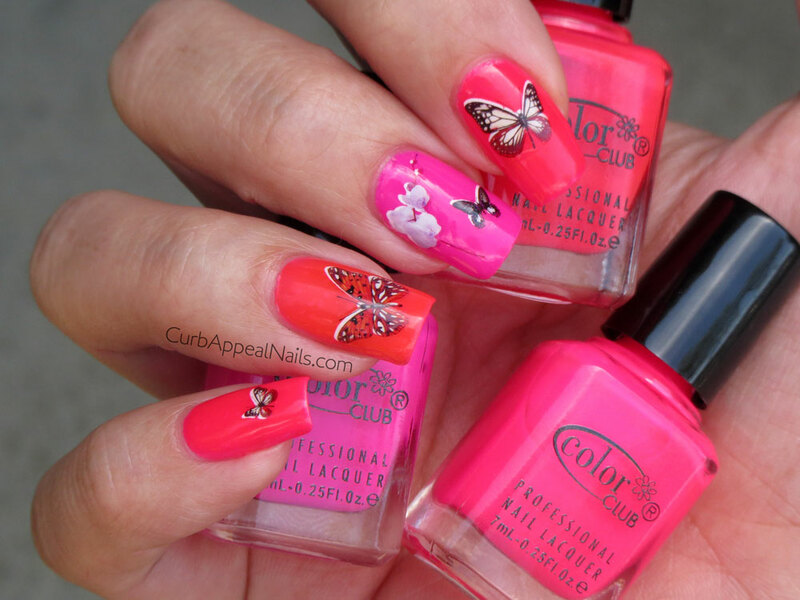 The butterfly and orchid water decals are some of my favorite and can be purchased on Amazon here. After placing the decals I added a top coat of HK Girl. The neons (as with most) are a little on the sheer side, but with three thin coats and the decals there was hardly any noticeable VNL. They glided right on the nail and are so juicy and squishy I am so glad I bought all of them! I've been staying away from neons and pinks because that combo used to be my go-to color before I got into polish, and had felt that now that I am a polish hoarder and addict, that I must always go with something different. But I now remember why I loved it so much then, it is lovely against my skin tone, and I think pink matches pretty much everything! Does anyone else think that too? Off to Rome and Sardinia soon...ta-ta!